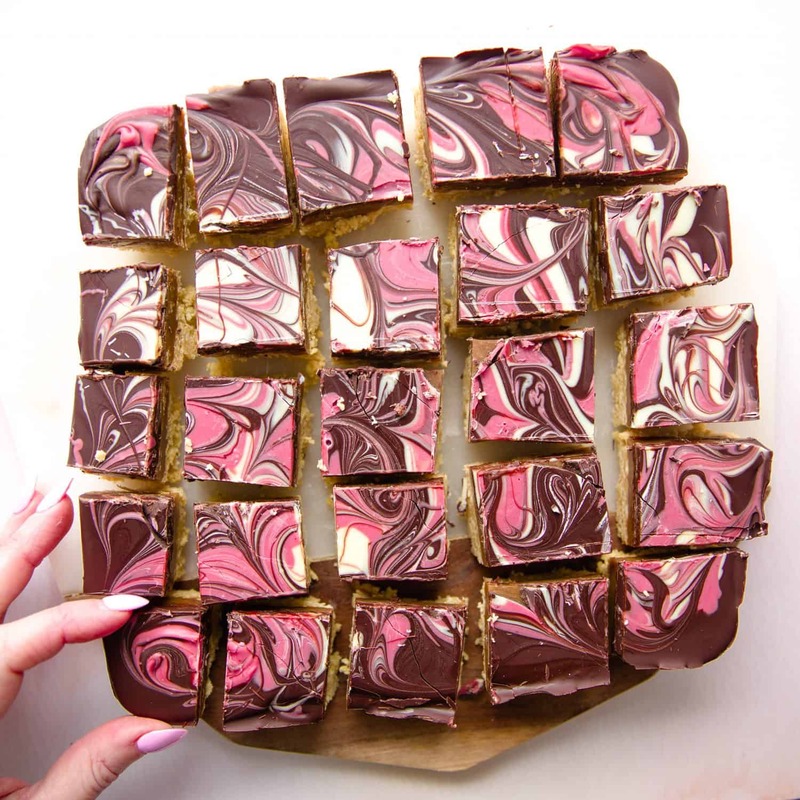 This is not just any ordinary Millionaire Caramel Shortbread, I’ve mixed dark, white and pink chocolate to make a beautiful marbling effect on top. 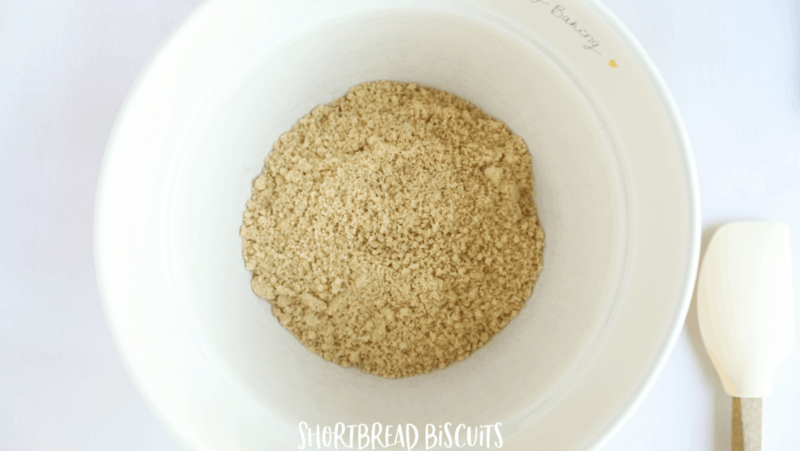 The base is an easier version of shortbread from scratch, instead, I use crushed shortbread biscuits mixed with butter which is much quicker. 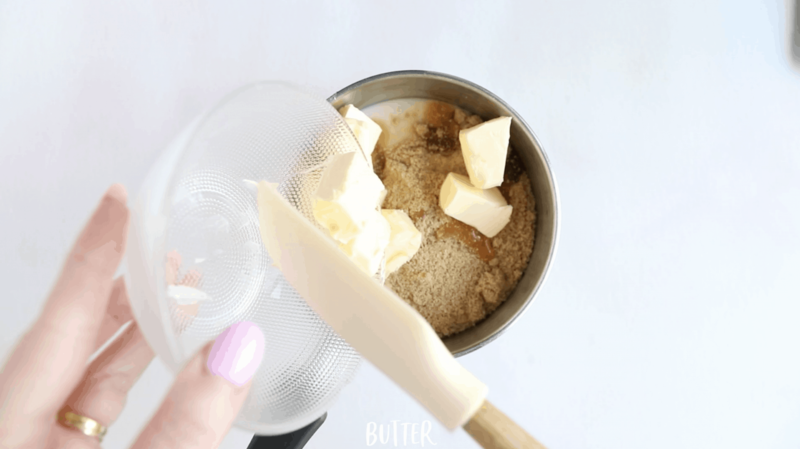 Read on for my tips on how to turn a tin of Carnation condensed milk into perfect every time caramel. 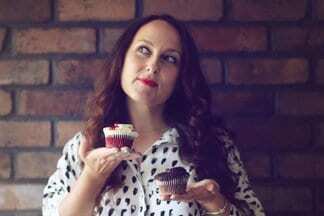 And don’t miss my trick for turning white chocolate pink. I hope you’ll all join me in whipping up delicious squares of marbled chocolate caramel shortbread fit for a millionaire! 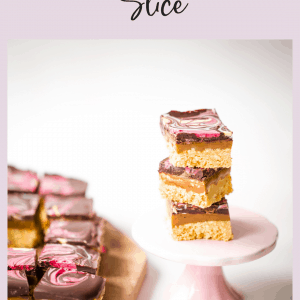 For this recipe you will need: a square baking tin, shortbread biscuits, butter, condensed milk, light brown sugar, golden syrup, dark chocolate, white chocolate and pink powder food colouring. Can I use the ready-made Carnation Caramel instead of Carnation Condensed Milk? No, not in a Millionaire Caramel Shortbread. The ready-made caramel won’t set hard enough to support the heavy chocolate layer and you’ll end up with a very oozy Millionaire Shortbread! Save the Carnation Caramel for Banoffee Pie. 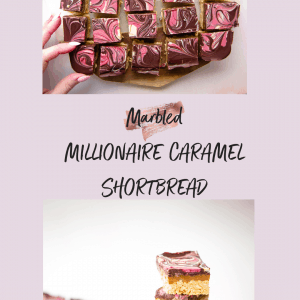 Why is it called Millionaire Shortbread? 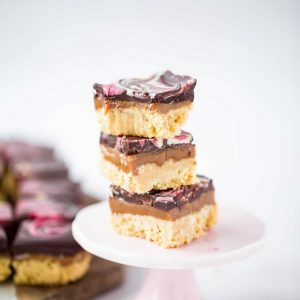 Millionaire shortbread goes by so many names I wasn’t quite sure what to name this recipe. Caramel shortbread, caramel shortcake, caramel slice: all with or without the Millionaire prefix. The millionaire in ‘Millionaire Caramel Shortbread’ comes from the rich variety of ingredients in the recipe, namely the butter, condensed milk and all that lovely chocolate. It’s worth mentioning that shortbread is thought to have originated in Scotland. I do hope any Scots reading won’t mind that I’ve used shortbread biscuits rather than making my own from flour. How do I stop the caramel from crystallising or burning? I use a small handheld (non-electric) whisk from the minute I put the condensed milk and other ingredients on the hob. You need to keep stirring so it doesn’t catch and burn and using a sugar thermometer really helps with any crystallising. 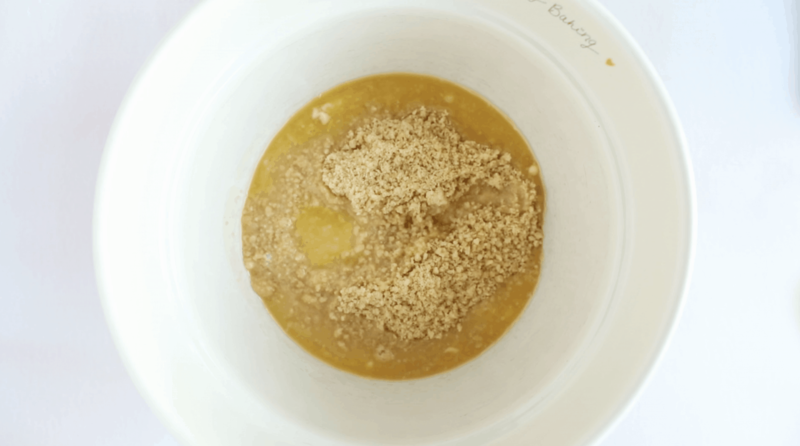 You need to stir the caramel until you feel like your arm is going to drop off and then stir some more! IF the caramel catches on the bottom of the pan or starts to crystallise, take the pan off the heat and beat in a teaspoon of cold water. 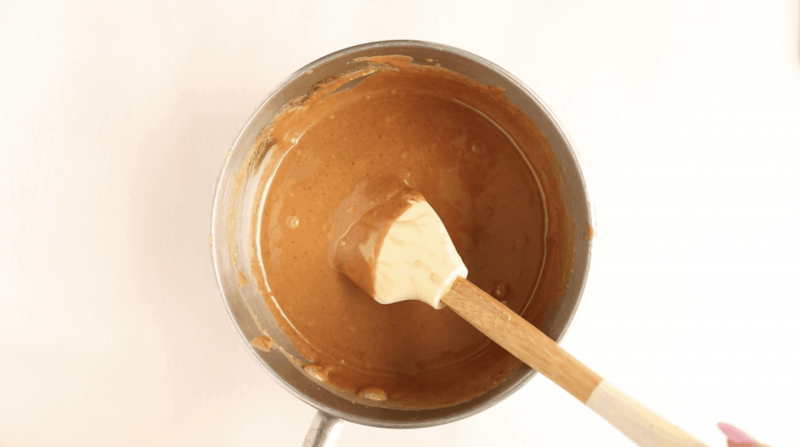 This will rescue almost any caramel disaster – the real trick is not taking your eye off it. It only takes about 5 minutes to turn from milk to beautiful brown caramel and is well worth the time it takes for real caramel. How long does caramel take to set? The caramel layer will take about 30 minutes to set in the fridge then you can go ahead and pour over the chocolate. 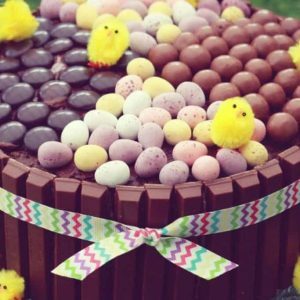 Is it better to use dark or milk chocolate for the chocolate layer? It’s completely up to you. I’ve used dark chocolate as it shows off the white and pink marbling better but I frequently use just milk chocolate on its own. Can I freeze Millionaire Caramel Shortbread? Yes! The caramel shortbread can be frozen for up to 3 months or will keep in an airtight container for at least 2 weeks. 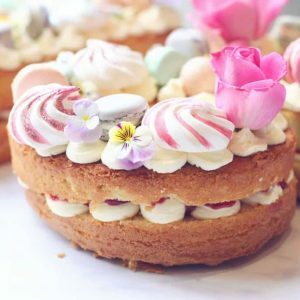 How do I make pink chocolate? You can’t colour chocolate with regular gel-based food colouring because it will make the chocolate seize and go really gritty and turn it into a clumpy mess. You need to use an oil or powder based food colouring instead. I use this powder from Amazon, just a touch of powder gives a really strong pink colour. I made a short video of the steps for this recipe. 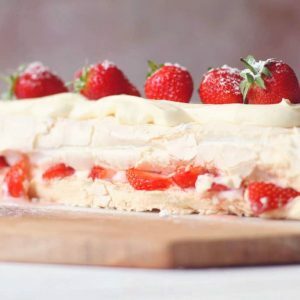 You can see it in the recipe card below – hope it helps. 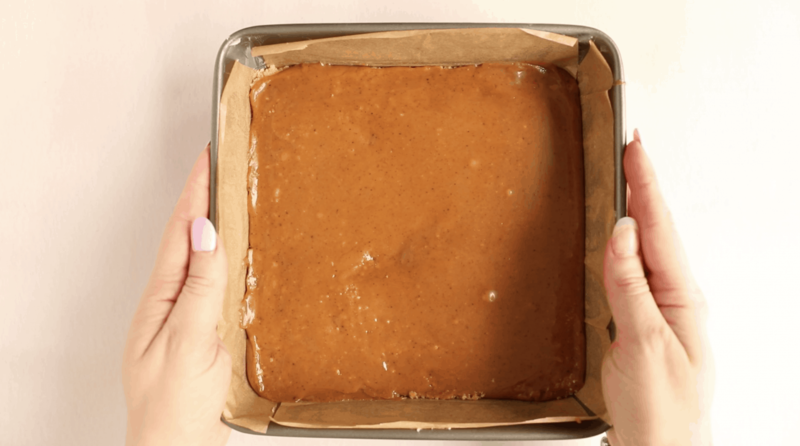 Making Millionaire Caramel Shortbread couldn’t be easier, just follow these simple steps. In a food processor, blitz 300g of shortbread biscuits. 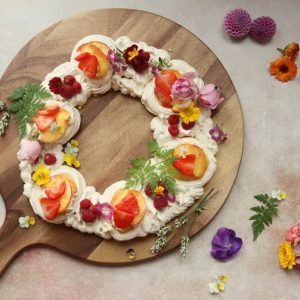 You can also do this by hand using a rolling pin. Add 120g unsalted melted butter and mix to combine. Pour the biscuit mixture into a lined 20cm square tin. Refrigerate until needed. Add a 397g tin of condensed milk, 100g light brown sugar, 2 tbsp golden syrup and 100g of butter to a medium size saucepan. Heat for around 5 minutes until a thick caramel sauce forms. Remember you need to stir the sauce constantly to ensure it doesn’t burn or crystalise. When the caramel has set, melt 200g dark chocolate and 100g of white chocolate in separate bowls over a pan of boiling water (bain marie). Don’t microwave it – especially the white chocolate as it will likely seize. Use a powdered food colouring (see FAQs above for details) to colour half the white chocolate pink. 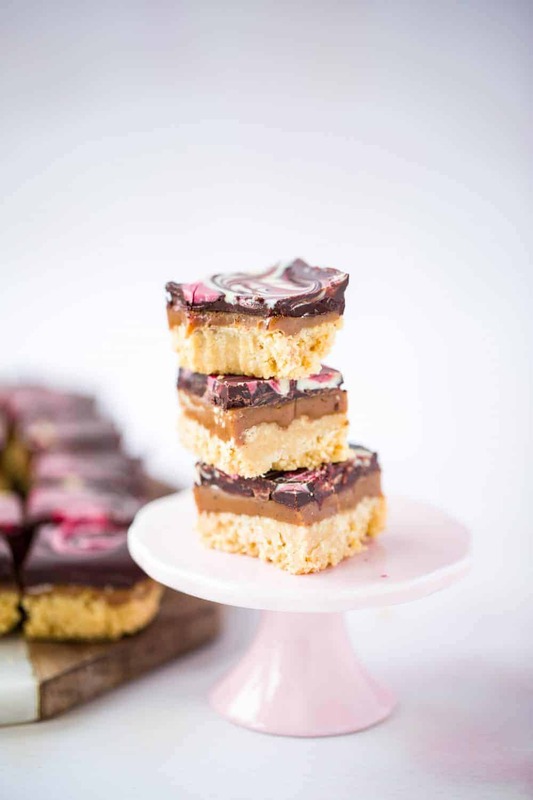 Pour the dark chocolate over the caramel layer and dot the white and pink chocolate over the top. 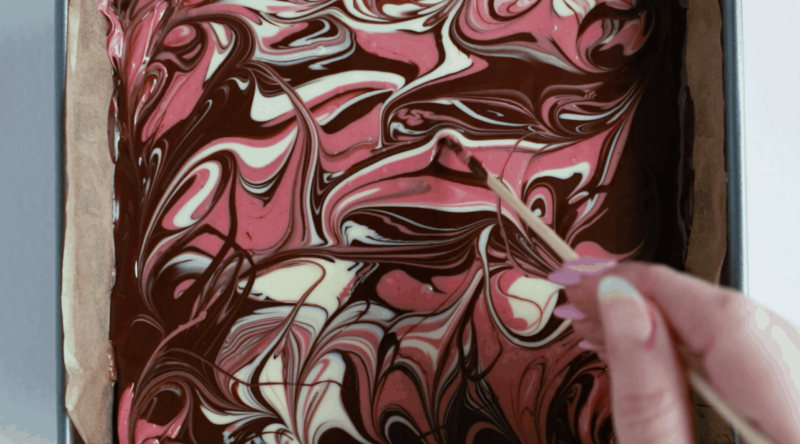 Using a cocktail stick, swirl the dark, white and pink chocolate together to create the marble effect. Refrigerate until the chocolate has set then slice into pieces and enjoy! Add the zest of an orange to the biscuit base for extra zing! Fudgy Peanut Butter Brownies – Chocolatey, soft, gooey and fudgy brownies that melt in the mouth. A must for peanut butter lovers! 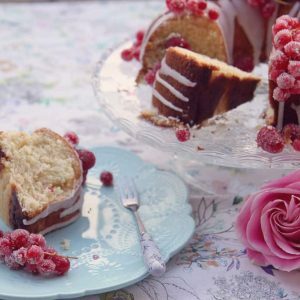 Classic Chocolate Roulade – A really easy roulade with fresh cream and raspberries. Light as a feather yet oh so rich chocolate heaven. Double Chocolate Orange Hot Cross Buns – With Easter on the way these are a must but are so good they should be devoured at any time of year. A twist on a classic recipe that once you’ve tried you’ll never want traditional hot cross buns again! Tear and Share Pain Au Chocolat – It’s one of my most popular recipes for a very good reason. HEAVENLY. Healthy Fruit and Nut Dark Chocolate Thins – They really are healthy, promise! The most perfect afternoon pick me up chocolate fix. 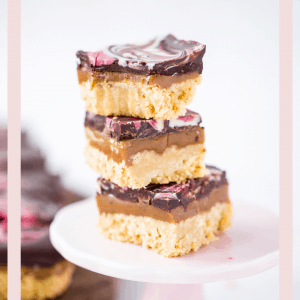 Buttery shortbread with a smooth caramel layer topped with dark, white and pink marbled chocolate. 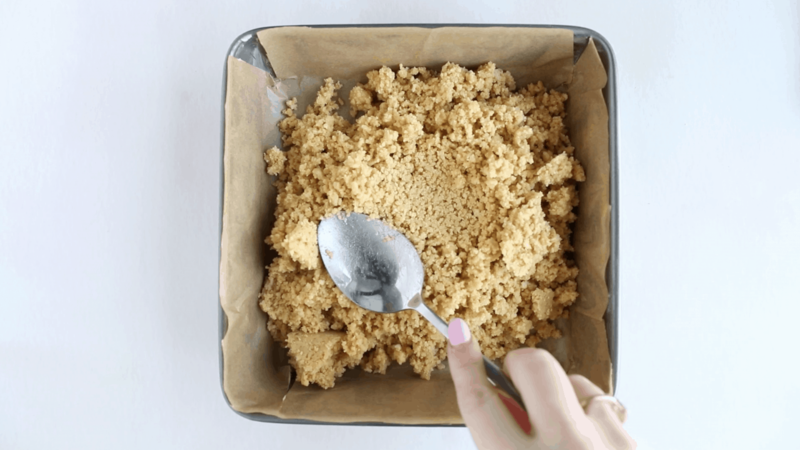 Pour the biscuit mixture into a lined 20cm square tin and press into the tin using the back of a spoon. Refrigerate until needed. Heat for around 5 minutes until a thick caramel sauce forms. Remember you need to stir the sauce constantly to ensure it doesn't burn or crystalise. When the caramel has set, melt 200g dark chocolate and 100g of white chocolate in separate bowls over a pan of boiling water (bain marie). Don't microwave it - especially the white chocolate as it will likely seize. Use a powdered food colouring (see FAQs above for details) to colour half the white chocolate pink. 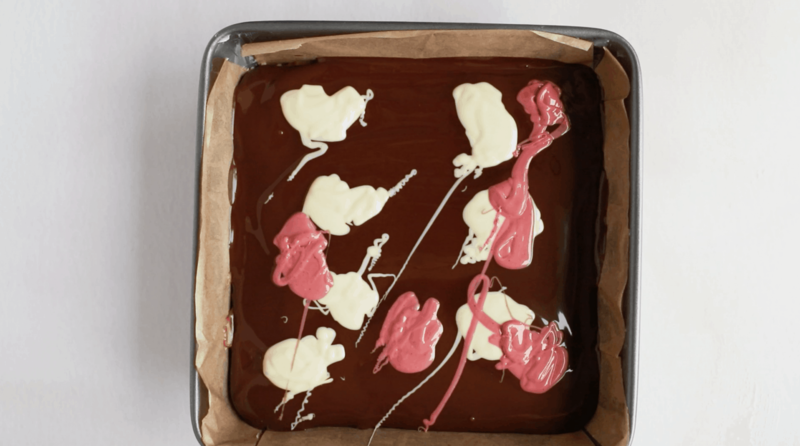 Pour the dark chocolate over the caramel layer and dot the white and pink chocolate over the top. Disclosure: This post contains an affiliate link. We are a participant in the Amazon Services LLC Associates Program, an affiliate advertising program designed to provide a means for us to earn fees by linking to Amazon.com and affiliated sites. There’d be none left over for the freezer in our house. They look great!